Ankle fractures are one of the most common orthopaedic injuries seen by physicians. It involves a break in one or both of the tibia and fibula bones at the level of the ankle joint. The end of the tibia bone forms the inside, or medial part of the ankle joint and is referred to as the medial malleolus. The end of the fibula bone is on the outside of the ankle and is thus called the lateral malleolus. The two bones form the ankle joint along with the top of the talus bone. Ankle fracture can result from low to high-energy mechanisms in all age groups. They typically occur from a twisting injury to the ankle joint. Often the soft tissue constraints around the ankle are also torn along with the break in the bone. The management of ankle fractures takes into consideration several factors including age, stability of fracture pattern, associated soft tissue injury, alignment of the ankle joint, .patient comorbidities, and patient expectations. As such, treatment options are also varied and can range from RICE and protected weight-bearing to surgery fixing the breaks with plates and screws and reconstruction of soft tissues. Rest, ice, compression and elevation are reserved for low-energy injuries around the ankle that are stable. 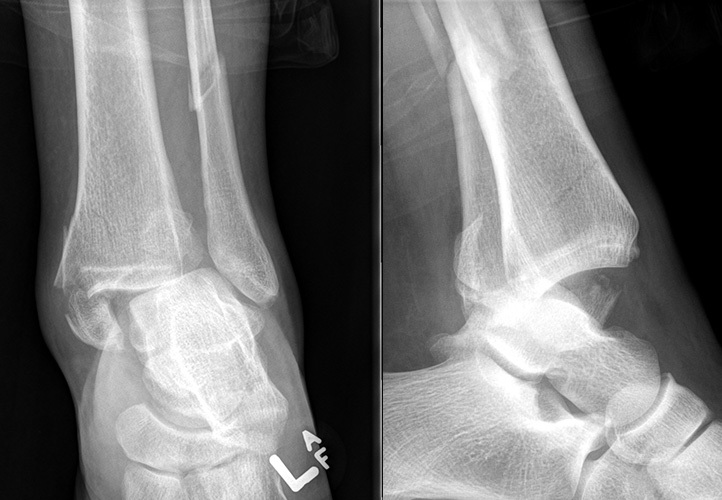 These are often simple avulsion fractures that are really boney variants of ankle sprains. Patients are usually casted due to swelling and pain after acute injury. Once significant fractures have been ruled out, immobilization is often changed to a walking boot and functional rehabilitation for range of motion and strengthening is commenced 3 to 4 weeks following injury to speed up recovery. Higher energy twisting mechanisms can also lead to breaks involving one, two, or three sides of of the boney structural support around the ankle joint. Single-sided breaks typically involve the outside part or the distal fibula/lateral malleolus. When these breaks are minimally displaced and the ankle joint is congruent, casting is often sufficient treatment along with protected weight-bearing for a period of 6 to 8 weeks. When the joint is not reduced physicians may attempt a closed reduction with sedation and molding through the cast. 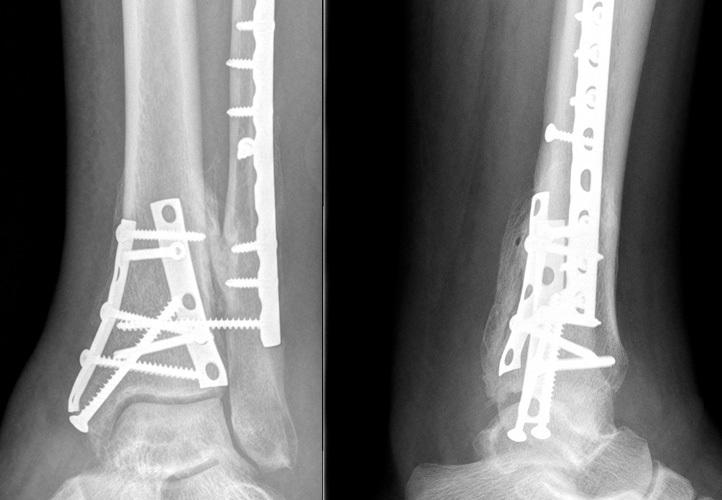 When this is successful, surgery is necessary to prevent long-term damage to the ankle joint secondary to malalignment. Unstable injuries involved multiple sides of the ankle joint which can often result in partial or complete dislocations. Surgery to reduce fracture pieces and the joint may need to be delayed with the patient temporized in a splint due to soft tissue swelling. Open reduction and internal fixation of fractures means the surgeon will use a combination of plates and screws, sometimes wires as well, in order to piece the broken bones back together. Following surgery patients are usually kept non-weight bearing for a minimum of 2 weeks and often up to 6 to 8 weeks total. Following immobilization rehabilitation is started to maximize functional recovery. The main goal of ankle fracture management is to try and prevent long-term consequences such as instability of the ankle joint with activity and ultimately ankle joint arthritis. With stable fracture reduction and fixation, most ankle fracture patients can get back to a high level of activity with minimal functional loss. While significant displacement will likely lead to post-traumatic degenerative changes in the ankle joint, successful treatment will likely delay the onset of these symptoms resultant dysfunction.